In case of temporary network failure, transaction is stored in the flash memory of iBonus Terminal. Up to 5000 transaction can be stored in the memory. As soon as the network is reestablished, the transaction is sent back to server. iBonus Terminal temporary stores transactions. In case of network congestion, iBonus Terminal has transaction buffer which stores up to 5000 records. As the database in iBonus is used as buffer, the data integrity of the database is taken into great care. Journal database is implemented at iBonus Terminal. During Terminal start-up the flash memory copy of the database is decompressed to RAM. During the transaction, each updating SQL command is recorded at the journal file after successful execution on the RAM copy of the database. The database is committed either periodically or when the journal file reaches a certain size. During write back, the RAM copy is written back to the Flash memory. In case of unexpected power shutdown, all the commands in the journal file are re-executed against the flash memory copy of database. iBonus System redefines the best practice of smart card payment and bonus point system. Our dedication to the details against deployability, manageability and reliability has been highly recognized. Being distinguished from its competitors, our products are chosen by world class clients such as Hong Kong Octopus, Mass Transit Railway and US Army.iBonus System is a system which is fully documented with the help of Unified Modeling Language. Drawing floor plan before building a house is mandatory. The necessity of documenting before coding is no different. Just presenting a card on to terminal for a purchase transaction takes up 13 steps. One step fail, the whole process will be compromised. Therefore, it is necessary to have all critical functions to be documented with detailed specification and test cases. Every release of iBonus Systems including customized version is regression tested. With 5 years of track record over hundreds of deployments, iBonus System is proven to be one of the most reliable smart card payment and bonus point system. Standalone terminal supports TCP/IP communication to Server. No PC is required at any branches. Equipped with embedded application, iBonus Terminal is designed to operate independently at any branches. With RJ45 socket, it can connect to server directly with TCP/IP protocol. It saves up the cost of installation and maintenance of PC workstation at branches. Require no fixed IP or port forwarding for Terminal setup. With the professionally designed communication protocol, iBonus Terminal does not require fixed IP or port forwarding at any branches. The whole system is still functional in such IP configurations. Apart from the saving of the cost of fixed IP and purchasing the extra routing equipments, this feature makes the set up of connection becomes as easy as connecting a notebook to the Internet in a café. Rapid Terminal registration to Server at terminal side. To register an iBonus Terminal, engineer simply needs to enter server IP and port number at the terminal. Engineers can now concentrate their work at branches without the need of changing any settings in the server. It radically speeds up the progress during the installation phase. Master Card Merchant can purchase their own cards from any supplier and control the amount of card being issued at any branches with the quota and key distributed by master card. iBonus Terminal supports the widely used NXP Mifare Classic 1K and 512bit Ultralight card. They are readily available to be purchased around the world. Additionally, with the help of iBonus Master Card for the distribution of card formatting quota, encryption key and company code, branches located countrywide can order smart cards directly from their closest supplier and issue card with their own terminals. This design minimizes the procurement time and shipment cost without scarifying the head quarter’s control over the numbers of cards issued at any branches. This is the ultimate card issuing method that streamlines the card issuing process. Identify final transaction record when Terminals' clocks are inaccurate. iBonus Server identifies the sequence of the transactions through a transaction count on each member card. Should there be some inaccuracy of in the clock of the terminals or the transactions not reach the server in the same sequence of those actually took places in different terminals, server can still put the transactions in the right order and calculate the latest values of every member card in the Member table in the database. Member can be guaranteed to check up their latest balance in their card in the web report. Also it facilitates correct and easy tracking of transactions. Reconstruct the lost records due to terminal malfunction. Using Smart Record Sorting (SRS) technology, iBonus can reconstruct the values in the records in the damaged terminal basing on the values of record before and after the lost record. It further enhances the integrity of the data for accounting purpose. *This feature is not included in standard version of iBonus System. Please contact our engineer for detail. iBonus system guarantees the accuracy of the values recovered during card repair and replace. If there are some terminals working offline have not yet sent back transactions, server will automatically wait for the record transmission or auto deregistration of the concerned terminals, and calculate the values of the repaired/replaced card. By employing Smart Recording Sorting (SRS) technology, iBonus guarantees the repaired/replaced card will reflect the latest balances. This data handling method realizes branch level card management and guarantees the high accuracy that any other distributed system can hardly deliver. With the help of Smart Record Sorting (SRS) technology, server can reconstruct the transactions possibly done in a stolen terminal. If reload or bonus point addition is done in that terminal, administrator can blacklist the card whenever appropriate. This will minimize the economic lost due to the illegal use of those cards and further protect the merchant’s property. By removing expired card entry from blacklist, it guarantees to operate perpetually. In order to support offline operation, every terminal carries a blacklist. The accumulation of blacklist will become a burden of network bandwidth and memory of terminal after a long period of time. Therefore the blacklist of iBonus Terminal will only include the serial number of the member cards which are still within validity period. Serial number of the expired cards will be removed from the blacklist. This will guarantee the efficient use of resource in long run. With the blacklist being handled efficiently, the member card can be blacklisted quickly, and the card’s balance is protected in an efficient way. Staff Card ID is logged for every transaction. It will facilitate auditing at the server report. iBonus Report can summarize the amount collected by each individual staff. Staff card is needed to be presented to the Terminal again for some transaction types which are less frequently used. It will ensure staff intention on using those transaction types. iBonus Master Card defines the maximum prepaid amount to be stored in each card. This safety measure enhances the safety for the card users. Maximum transaction limit must be defined in each staff card. All transaction that alters the accumulated spending or prepaid balance is limited by this value. 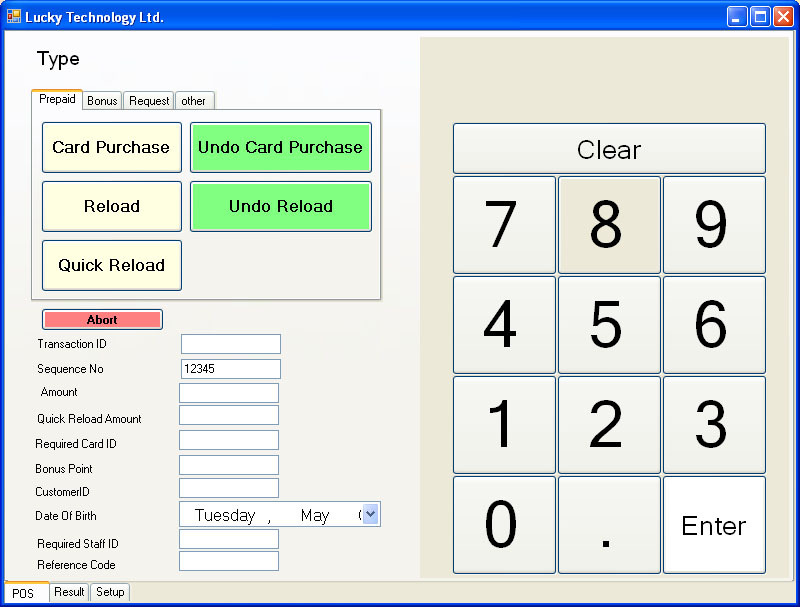 iBonus System unifies the smart card system with the POS system. All the transaction types in iBonus Terminal are accessible by POS through RS-232 serial port. Coming with a ready made Windows based API, all the generic transaction set and advanced card handling functions can be accessed with ease. 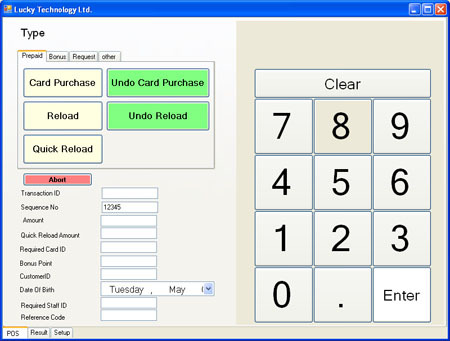 In addition, with the help of read member card and read staff card functions, POS can command the most suitable transaction based on the POS side member profile. When printer is connected, a receipt is printed whenever any transaction is made. Press the button A if you wish to reprint the receipt of the last transaction. If auto reprint is on, two receipts will be print for every transaction.